This paper examines adaptive approaches to aid programming in Nigeria. Through field research and desk reviews, we have investigated some of the assertions around the ‘adaptive management and programming’ approach, which has arisen in recent years as a response to critiques of overly rigid, pre-designed, blueprint and linear project plans. This is the second of three case studies in a series which explore if and how adaptive approaches, including rapid learning and planning responses, are particularly relevant and useful for promoting empowerment and accountability in fragile, conflict and violence-affected settings (FCVAS). 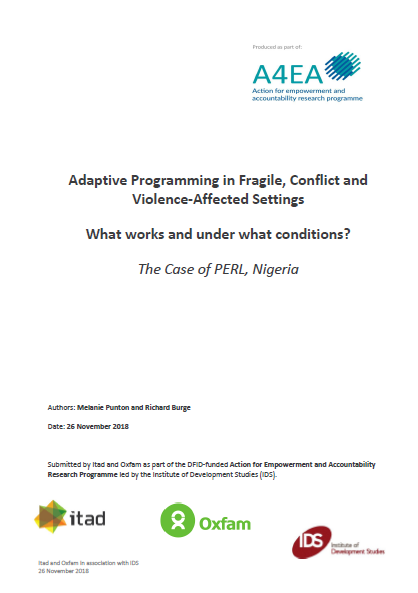 This case study focuses on PERL (Partnership to Engage, Reform and Learn) in Nigeria, a five-year governance programme (2016-21) with a total budget of £100 million. It aims to promote better service delivery through bringing together government and citizens groups to collectively address governance challenges. PERL is viewed by DFID as the final stage of a 20-year investment, building on learning, experience and partnerships from 15 years of DFID-funded governance programming in Nigeria. It was designed to incorporate learning and adaptation through a ‘living’ theory of change, continuous political economy analysis at different levels, adaptive implementation by location-based delivery teams who are encouraged to be flexible and let partners take the lead, regular learning and reflection, and adaptive resourcing, HR and administrative systems. The case study draws on a conceptual framework (the ‘adaptive triangle’) that looks at three types of adaptation – adaptive management, adaptive programming and adaptive delivery – and the interconnections and tensions between them.